This quaint villa has a pool nearby and internet access. There’s partial air-conditioning in the bedrooms, which are non-smoking for those who prefer not to have a cigarette smell lingering around. With the modern amenities you need to relax, Oceana Villa has a media devices, a coffeemaker, fax, microwave, and satellite. There’s even a VCR if you enjoy older movies you can’t find on DVD. The villa comes with daily maid service, except for on holidays and Sundays. Ocean Villa works quite nicely for two couples to enjoy a relaxing vacation in tropical Vitet. Better yet, it’s private, and is out of the way from tourists. 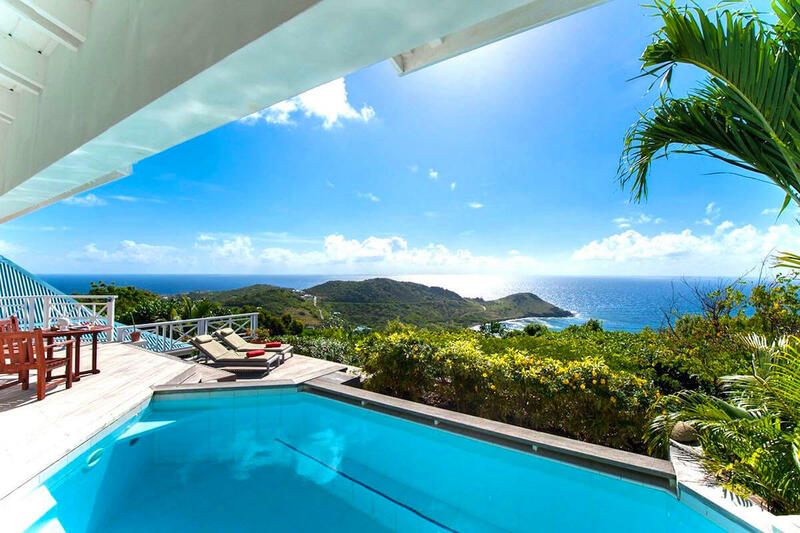 Oceana is a 2-bedroom, 2-bath villa located in one of the most private locations in all of St. Barts. Oceana is up high in Vitet, overlooking Toiny Bay and the ocean. The villa offers a living room, and dining room facing the ocean, two private bedrooms, located at opposite sides of the villa. Oceana has terracotta and wood floors. The villa also has a TV room with air-conditioning. It is equipped with Satellite TV, Hi-Fi set with CD player, and VCR. Each bedroom is located in a private bungalow just steps from the main pavilion. Both bedrooms offer ocean views, air-conditioning and en-suite private bathrooms. The two bedrooms also have a Hi-Fi set with CD player. Welcome 12 years and older please.